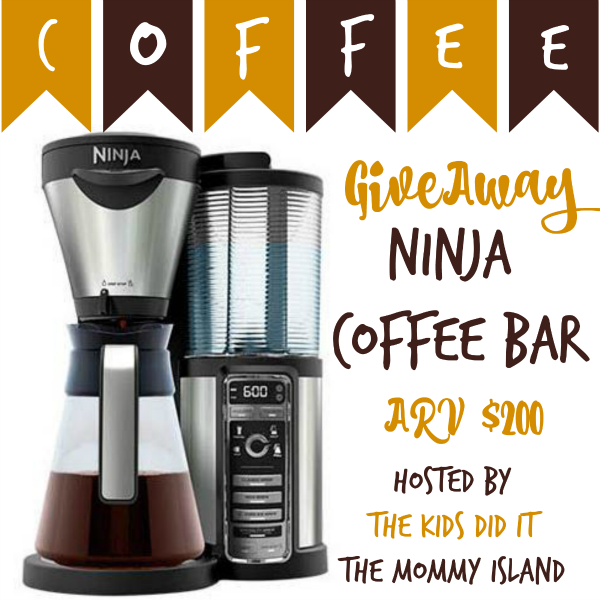 Welcome to the Ninja Coffee Bar giveaway hosted by The Kids Did It and The Mommy Island! The Ninja Coffee Bar™ brewer changes the game, bringing rich flavor home—turning your favorite ground coffee into anything-but-basic black. Not to mention all of the refreshingly robust Over Ice drinks and frothy, flavorful Specialty beverages you can whip up at the touch of a button with our concentrated coffee. Read Amanda's Ninja Coffee Bar Review! One entrant will be selected to receive a Ninja Coffee Bar ($200 ARV) Open for entry in the Continental US, 18 years and older from 03/17/16 thru 03/31/2016 at 11:59pm EST. Winner will have 24 hours to respond to the notification email to claim their prize or a new winner will be selected. See Gleam Form for official rules. Hosts & participating bloggers are not responsible for fulfilling prize obligations. I've always wanted a Ninja Coffee Bar after seeing it advertised on TV. This looks so cool and neat! I like salted caramel lattes. I love just about ANY flavor Latte. I love coffee with mocha of some sort in it. Whipped cream on top is an added bonus!